I left the Southern California Dirttime Rendezvous at Wind Wolves Preserve on Monday night rather than Tuesday morning as I didn't want to drive across the desert (including Barstow, Baker, and Las Vegas) during the heat of the day. 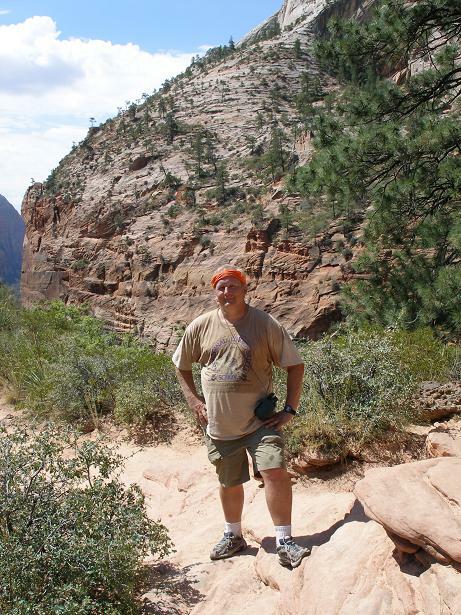 I had dinner at the Denny's in Mojave, CA, and drove all night reaching Zion National Park around 4:30am. I drove into the South campground and set up my tent and was asleep by 5:00am. My sleep was comfortable but short lived. I awoke around 8:30am and by 9:00am I was packed and ready to go. I knew I had to get an early start if I was to get any hiking done before continuing my return trip home. 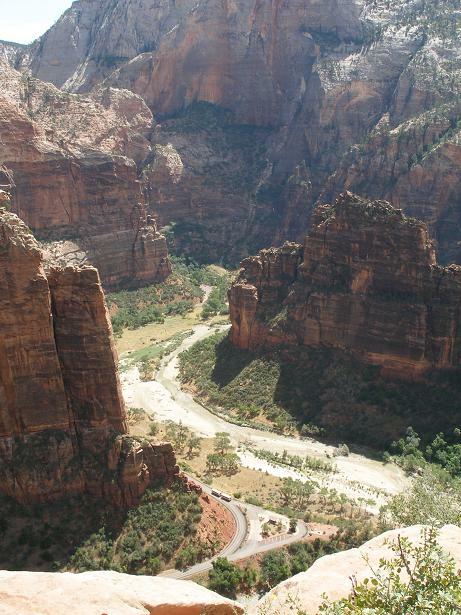 I drove to the visitor center and caught the shuttle bus to the Angels Landing trailhead. 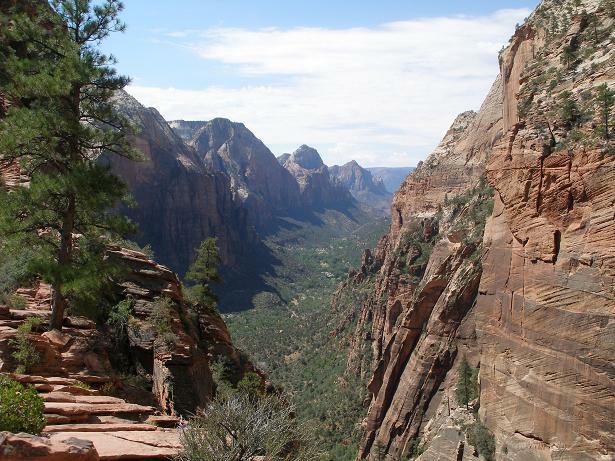 I was going to hike to Scout Lookout and (hopefully) Angels Landing. 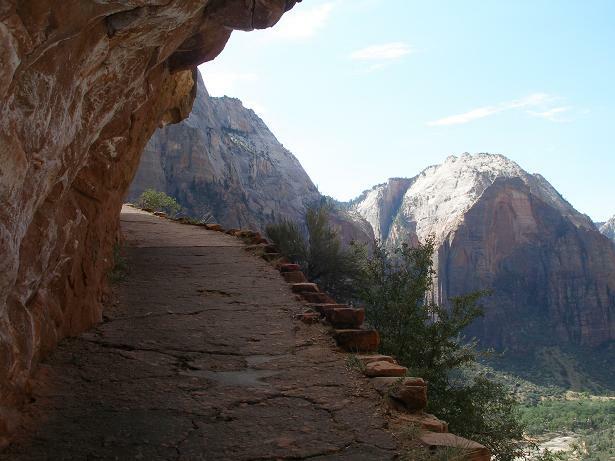 The two mile hike to Scout Lookout was no problem, but I am a hiker, not a climber, and the sheer dropoffs of the Angels Landing trail and my fear of heights prevented me from completing the final half mile. The trailhead is on the east side of the highway. 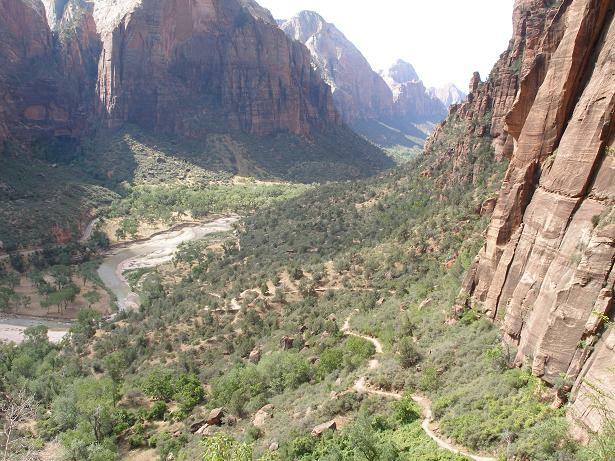 The trail crosses the Virgin River then works its way north and UP. 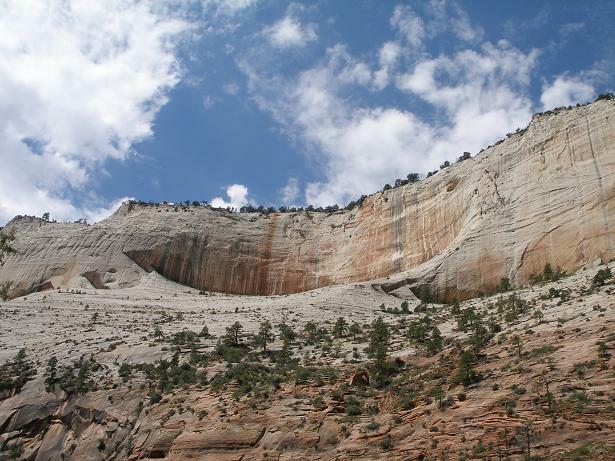 Parts of this trail are carved into the sides of the cliffs. The trail is paved most of the way to Scouts Lookout. This area is known as Walter's Wiggles. It is very difficult to photograph well, in part due to limited light as you are inside a narrow canyon. I was pleased with myself when I passed a group of about a dozen college students, each less than half my age, as I walked up the wiggles with no problem. Old men rejoice! The canyon above Walter's Wiggles. The view from Scout Lookout is incredible. It is, however, a sheer drop. In this photo you can see the shuttle bus on the highway below. 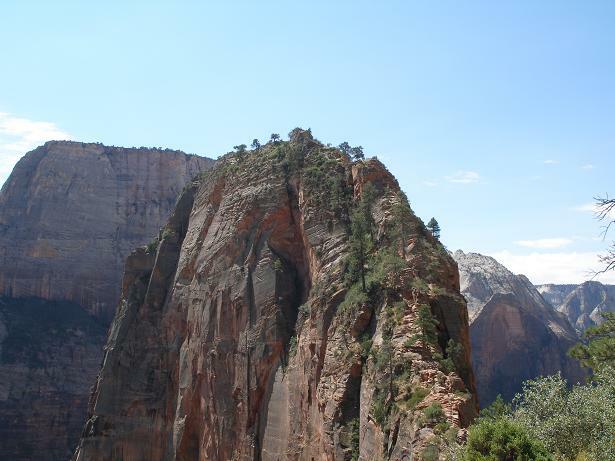 This is Angels Landing. I am still over a quarter mile away. This photo doesn't do it justice. Look towards the bottom of the photo to see how narrow the ridge is. That's the "trail"! I figure I made it about one third of the way. 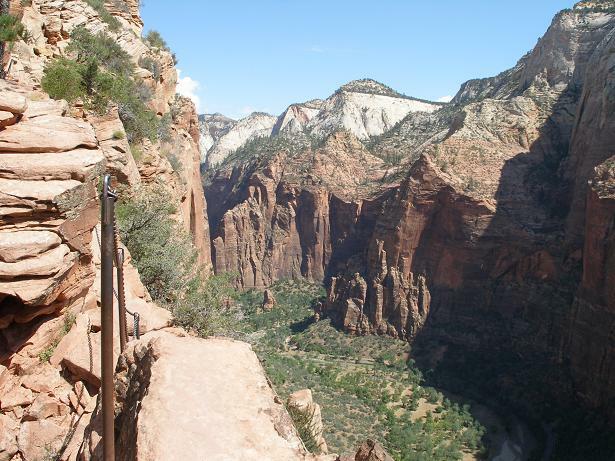 At this point the "trail" is only about three feet wide, with sheer drops on both sides. No doubt about it: fall and you WILL die. I decided it was time for me to turn around. 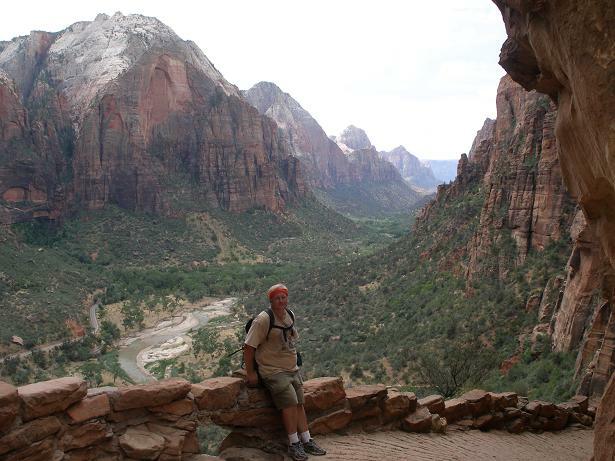 You see, I am afraid of heights (which always surprises those who know how much I love to hike.) One time I was on the roof of my house cleaning the gutters when I simply froze up. My wife had to call the fire department to come get me down! I really didn't have a fear of falling, as I knew I could hold onto the chain. But I did have a fear of freezing up. I didn't want to be the next park "incident" with a couple of park rangers having to coax me down. Another view from the same spot. You know the problem with this kind of climbing is you can go up without looking down, but you cannot go down without looking down! I was surprised how little trouble I had making it back to Scout Lookout. In retrospect, I think if I had tried again (even if I only went a little further and came back down again, and repeat) that I may have been able to make it. But as I said before, I really didn't want to become the next park "incident". 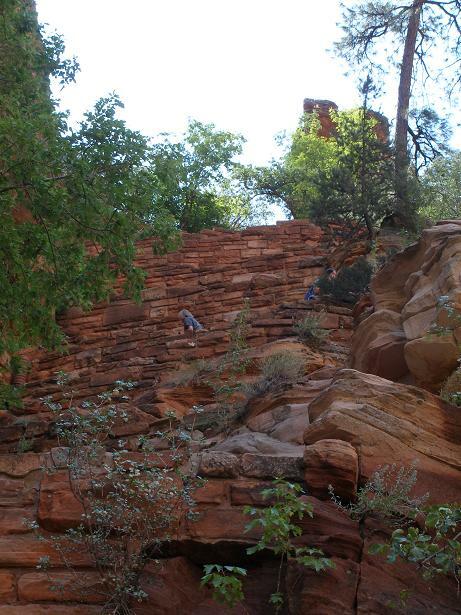 And those college kids I had so smuggly passed on my way up, well they kept on climbing. A parting shot on the return trip. 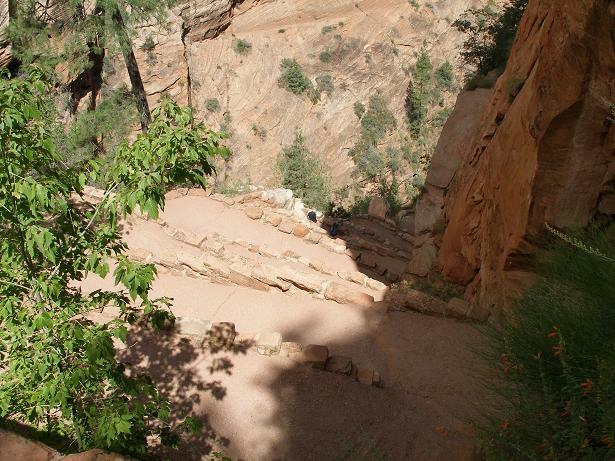 When I got down I returned to the visitor center and asked a ranger if anyone ever had to be rescued from Angels Landing. He said yes, that earlier this year someone had a heart attack up there, and that occasionally people such as myself will freeze up and a ranger will have to coax them down. He said he tried it five times before he made it to the top, and that was with some friends. Even then, he said he felt uncomfortable the entire way. So I guess I don't feel too bad about not making it. Copyright © 2005 by Bill Qualls. Last updated September 4, 2005.